'. But yes, according to Autotrader there are about twice as many 2018 Q5s available than 2019 RDXs; however there's still the problem of Acura's very limited exterior/interior color combinations, which does not seem to be an issue for any of the European brands (or Lexus, for that matter). The limited color combos is not new to the RDX. I think it’s partially a “right” supply issue - not enough of the right inventory left after June launch. In my area, supply is not satisfying demand with the 2019 RDX. They maintain about 3-4 to choose from at any given time, where there are twice that of any of the other mainstream models selling less per month. Right now that’s mostly A-specs and base. There are at least 3x that amount of Q5’s from which to choose on the local Audi lot. There hasn’t been an Advance package RDX on our local lot in 6 weeks or more. I’m currently told 8-10 weeks for my order. Initially that was quoted to me as 4-6 wks. (based on they’re recent experience) then when they put my actual order in, they told me the extended time. I’m sure an order doesn’t count as a sale until delivery. How many are not willing to order and go to one of the higher volume manufacturers with inventory? Not an expert here, but in my opinion there are a lot of things at play on units sold July vs. June and July vs. prior year. Initial launch in June was a success both from a 2018 perspective with the incentives given, but also a good selection to sell to early adopters on the 2019 models bolstering sales. June had 5 weekends this year. July had 5 last year. Initial launch left a depleted inventory (of the desirable color and package combos) relatively speaking for both model years. Orders seem to be strong, at least from the symptoms I see with lead time of my order and others I’ve seen on this forum. I think strong sales #s will follow. Let's not forget, this is an all-new model on a new platform with an entirely new production line. They may not be ramped up to full production, ironing out assembly-line glitches and the requisite minor defects that always happen in new models. I got a 2014 MDX the first month they came out, and it had a few snags but was a terrific car. My new RDX is probably the best car I've owned so far, even though it is bound to have some issues. Yes I could have waited and maybe saved some money, but then I wouldn't have this terrific car to drive all summer. There are lots of thoughtful details that continue to amaze me. A few points that you have mentioned here that most people ignore. The issue is most people just like to complain and never think about other stuff. You also cannot forget that MOST folks that purchase do not join forums and, those that do, are typically enthusiasts or folks that want to complain or look to resolve a problem they've encountered. What you see and hear on a forum is atypical and issues, at times, can be made bigger by folks than they really are...just my personal opinion. I do like the fact that the car can be OTA updated when Acura decides to push an update to the field versus going to the dealer. Last edited by quantum7; 09-04-2018 at 02:48 PM. 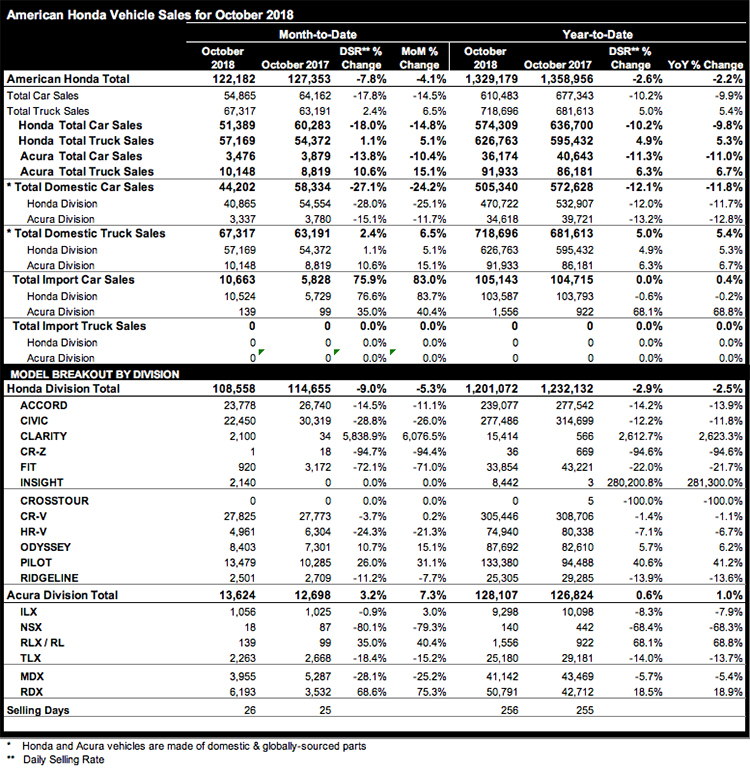 The 38% jump in MDX sales is interesting, especially with YTD sales being down slightly. It makes me wonder if people are going to look at the new RDX and discovering that, the discounts are small and that they can get a better deal on 'the big one'. The 2019 MDX is out and they're probably making a big push on the 2018s. I suspect if they had ramped up RDX inventory faster the RDX might have beat the MDX. Some people may go in for the RDX, find lack,of inventory and great incentives on the MDX and leave with a car. I probably see 4 or 5 MDX a day. They are everywhere. And the new Pilot. TLX is Toast at this point. And I don’t think the Accord has made a month. The competitors did even better. Audi sold 6,800 Q5s, BMW sold 6,300 X3s and Lexus sold 5,600 NXs and over 10,000 RXs. If Acura had inventory on the SH-AWD in southern states and west coast the sales would be larger. So many folks waiting for specific color combos and SH-AWD here in TX and none to be found. 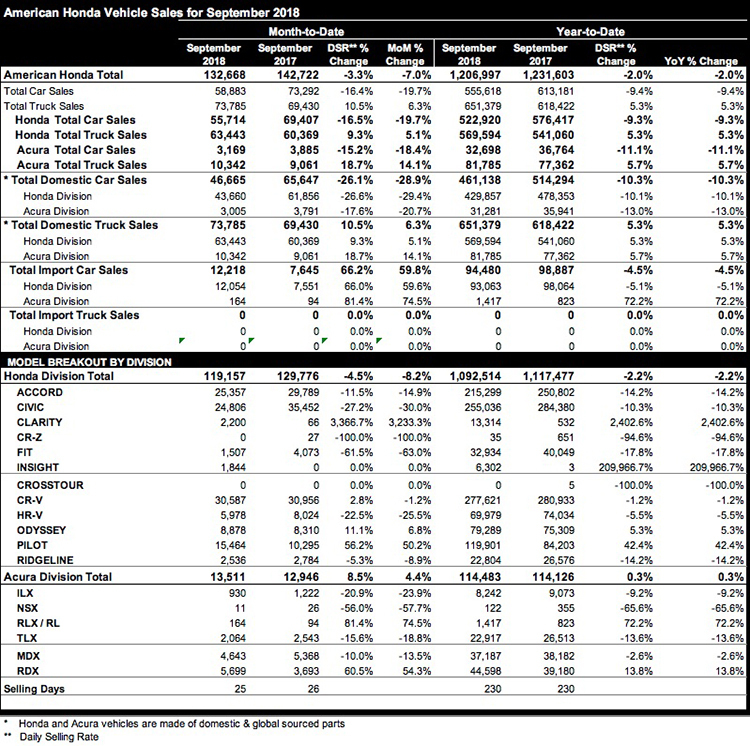 Let's see what the numbers look like when Acura has some time to balance supply to demand. White Advanced/ Expresso with SH-AWD is a unicorn here. I'm not in Texas, but waiting, too. I placed my order and deposit on August 17th for a Fathom Blue Pearl Advance SH-AWD and got word yesterday my build date was pushed back to the week of September 24th, which puts me at around mid-Ocober for delivery. Any updates on the sales figures for Sept? I cannot find anything. They're all being released tomorrow. 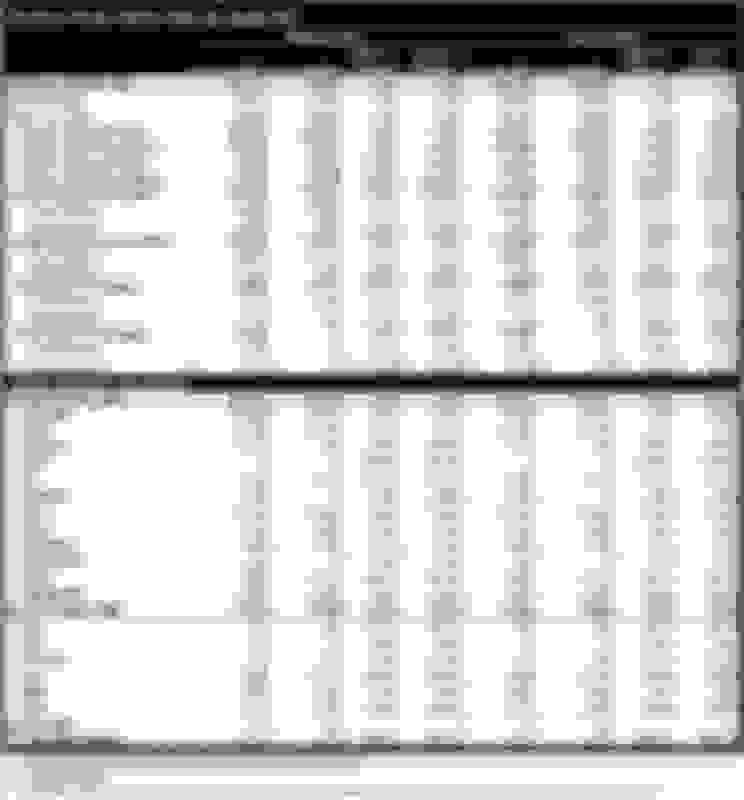 Checkout hondanews.com for the Honda sales. Heck, just about any color combination for the Advanced SH-AWD in Texas is a unicorn. I'm waiting on my Modern Steel Metallic/Graystone in Houston. I had to wait almost 2 months for my Gunmetal Advance to arrive. They are selling like hot cakes right now... and for good reason. Every time I look at any other CUV/SUV it just falls short. Not enough storage, not enough features, and/or not enough power. Price stretched the budget a little bit, but it's well worth it for what you get. Wow, 60% up! It looks like the RDX is basically carrying the Acura name and that makes sense considering it's the newest design. What's also interesting is the RDX is the best selling model but has the least amount of incentives on it. TLX debuted in the 2015 model year. The rest of the lineup really needs a redesign. I sat in the 2019 RDX at my local dealer and after sitting inside that I wouldn't get another model Acura, they just don't compare. The seats were probably some of the best I ever sat in. I am excited to see them move that interior into the rest of their lineup. I think when that interior is the rest of their lineup they'll be back up above 200,000 units a year again. Acura needs to bring the redesigned TLX and MDX as soon as possible. I am not sure about the RLX and ILX. But I strongly believe Acura should introduce CDX and a coupe or bigger SUV like ZDX or QX80. 200,0000 units will be achievable by end of 2020 since 2019 will be crucial as what Acura is going to offer. Acura is losing the sedan market with 15% sale decline for TLX. Acura did redesign the ILX for 2019 and the exterior is not that interesting. The 2019 ILX still has the same interior with dual screen setup. I hope Acura scraps the two screen design for the MDX and TLX. 902 RDX were sold in Canada. another amazing month! I think the one screen 1-1 touch pad is cool when I drove the RDX. However, I have nothing but good things to say about the improvements in the 2 screen set up in my 2018 Elite ASpec. The division of labour between the two screens is very clear now, although I had no big issues with my 2016 set-up other than the processing speed being slow at times. I certainly prefer my system over some of the German meandering touch pad -one screen set ups I have tried. At least the RDX system is safer than it's German counterparts. Having said that, no doubt Acura will implement the new ystem in the next generation of both the TLX and the MDX. RDX has been the best selling Acura vehicle for many years now. This continuation is just a prove that Acura did not screw up with the redesign. Last edited by acuraada; 10-08-2018 at 08:36 AM. 6,193 units sold! Another big month for RDX. Honestly Acura nailed it! I hope this really opens their eyes with where they should head the company. Well... I think they've already figured that out. They just need to execute faster! 100%! They can easily sell 20,000 a month if they bring the redesigned TLX, MDX and introduce CDX. RDX is the perfect example for Acura that the company can do much better if they offer the right product. Definitely taking sales away from the MDX as it had a terrible month. Pilot also stealing Acura away some people. Honda car sales are plummeting. Accord hasn’t made a month and Acura still behind on rolling out updated car models. Honda did not have a good month. And there was one extra day in the month. The CR-V, made in Marysville and East Liberty, set an all-time monthly record in December, with 42,079 units sold, a gain of 13.8 percent. Sales of the Honda Accord, also made in Marysville, skyrocketed in December, increasing 29.4 percent. Honda Clarity sales about doubled from November to December, with 2,857 sold last month. 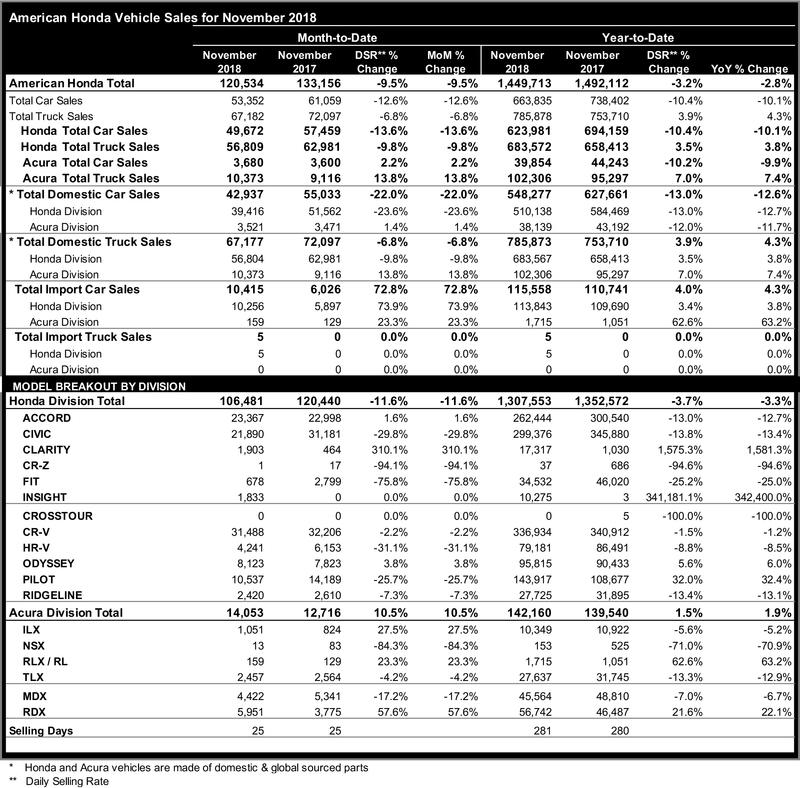 Acura also had a successful December, with a sales increase of 11.4 percent compared to last year. 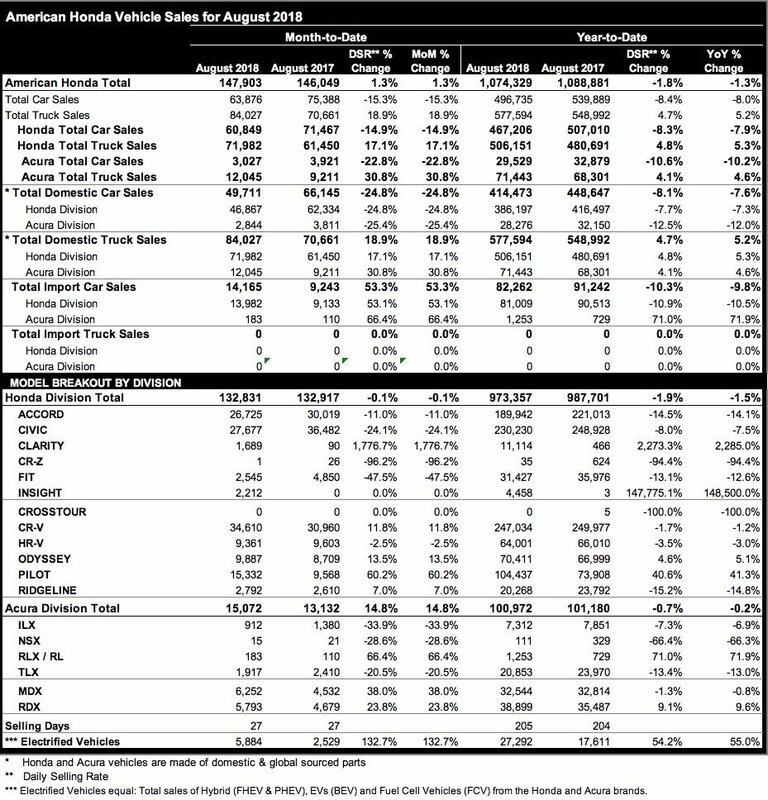 Acura sold 15,062 vehicles in December 2017. 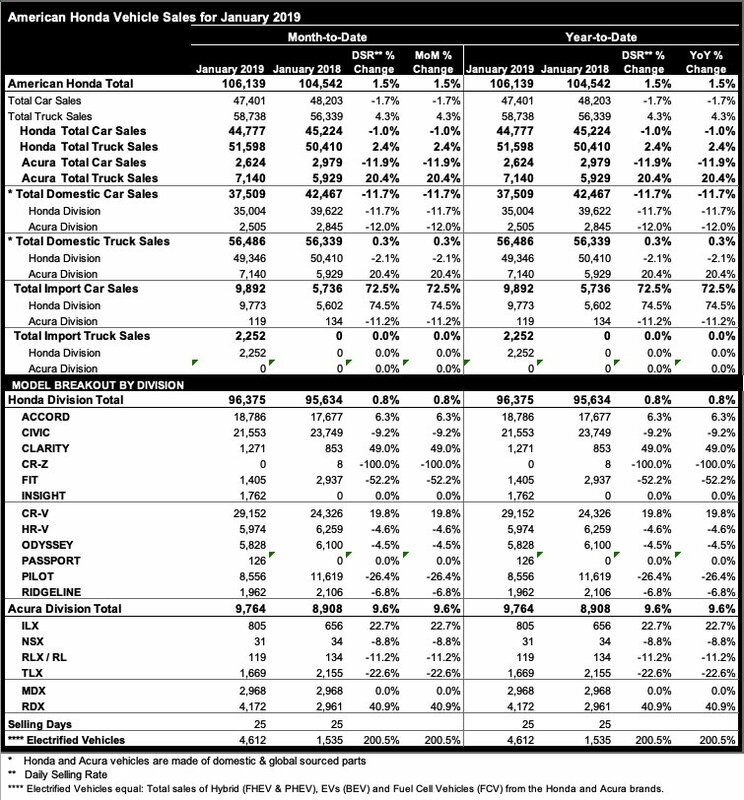 The ILX saw a 10.7 percent sales increase, while the TLX saw a 8.7 percent decrease in December. Both cars are manufactured in Marysville. Acura’s made in East Liberty also saw ups and downs. The RDX saw a 42.2 percent increase, while the MDX saw a 2.1 percent decrease in December. The RDX has been out for half a year, isn’t it time for one of the quarterly updates to the nav? I’ve had two so far. 6/27 and 10/18. No clue as to why they withdrew the updates. I’ve had zero issues with the updates. You are spot on. Acura was mostly a fancy Honda for too long. The 2004 TL was nice but then they went with dual screen set up later on everything and yuck. RDX should propel the change. Sad to see the demise of the sedan. They have a place IMO. 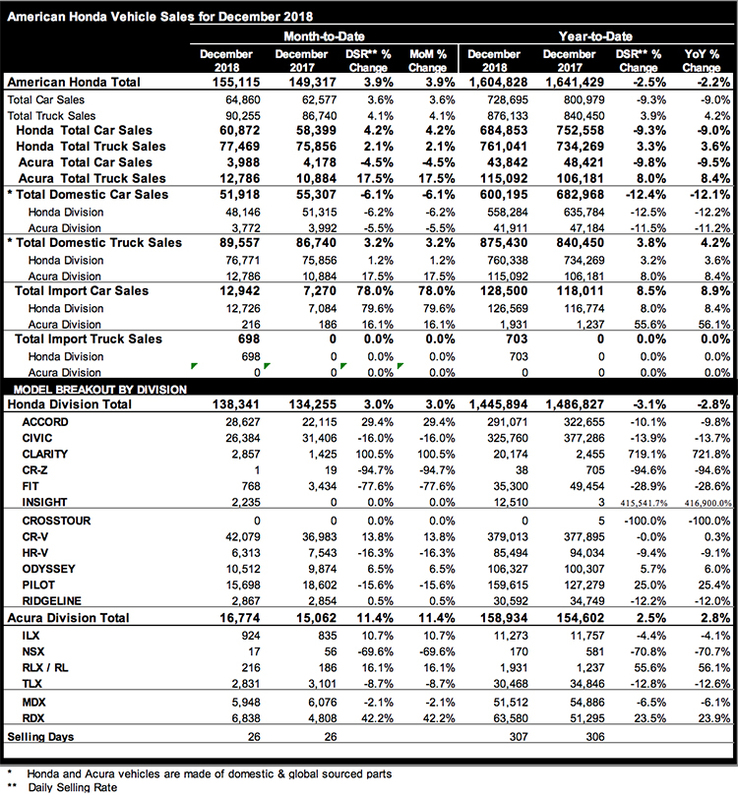 Accord sales only up due to HUGE incentives. They had $4000 lease cash on 1.5 Touring which combined with discounts yielded $7-8,000 off. The entire auto industry is struggling with sedans and not just Acura. Of course there is room for sedans. Acura just need to come up with a good sedan. I'm sure the 2020 model will be a carry-over from 2019. If any changes at all, they should be minimal. In Honda/Acura fashion I woudn't expect any meaningful updates until at least the 2022 MY. Looking at inventory at my local dealer's website, I see recent arrivals are priced $100 more now. Is this due to demand or something else? Delivery fee looks to be the same.